Quality Crafted by Mennonite Craftsmen in Holmes County, Ohio. Solid Red Oak Hardwood 16" Wide Hexagon Board. Double Sided - Plays up to 4 players on one side and up to 6 on the other. Complete with Game Board, Marbles, Dice, and Instructions. A Wonderful Family Game with Risk, Competition, and Aggravation! Sit down with the family and enjoy a classic game of Aggravation. 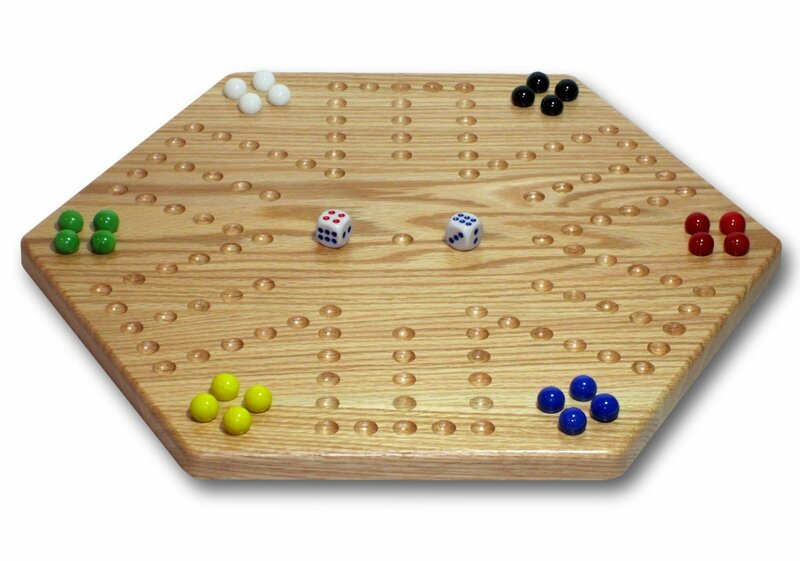 The 16"Aggravation board is made out of solid Red Oak wood in Holmes County, Ohio. Itis double sided so you can play with up to 6 players on the one side and withup to 4 players on the other side. To play, move your marble players aroundthe board according to the roll of your dice and try to position your marblesin the home positions before your opponents do. You can send your opponent'splayers back by landing on a location that they occupy, thus making them"aggravated". The Aggravation Board measures 16" (longest dimension - point topoint) x 14" x 0.75". The Oak Aggravation Board, 24 - 14mm Marbles in aDrawstring Pouch, Dice, and Instructions for Play are included.